Finding somewhere suitable for a large family or two sets of parents or kids can be tough, but Bear Pleasures can accommodate up to eight within a short drive of amusement parks in Pigeon Forge. 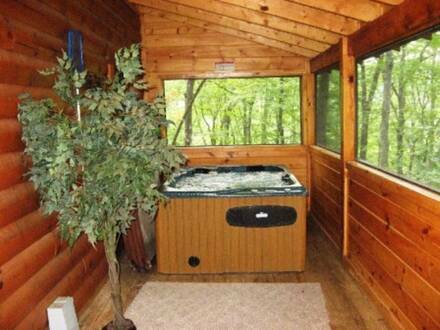 There are much more than bare pleasures in this cabin, where there is plenty of space for mom and dad to have a little romance, plus the kids will love the game room. There is no need to worry about the children making too much noise in this secluded spot, which is nestled high on a ridge in the Misty Hollow Resort. 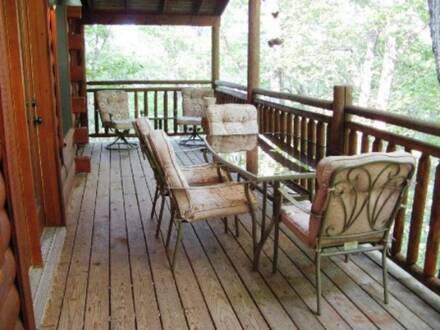 There are three outdoor areas in which to relax, including a covered deck with picnic area. 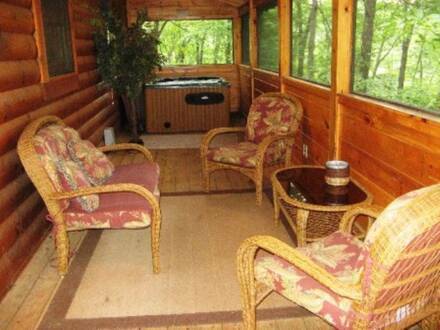 Put the kids to bed and get the bubbles going in the hot tub, which is located in a screened-in porch. You will find your stresses disappearing as you listen to the sounds nature and enjoy the peace and quiet. Inside, a full kitchen makes it easy to cook for the whole group and save money at the same time. A charcoal grill outside offers further possibilities. There are two bedrooms, which feature two queen beds and two twins, plus a sleeper sofa as well. The master suite boasts a bathroom with a jacuzzi tub mounted beneath a beautiful rock wall. The cozy living room has a leather sofa and comfy chairs beside the large fireplace, set in appealing river rocks and wide hearth. Upstairs in the loft is a game room with pool table, which kids of all ages will enjoy. Although you will feel miles away, book this cabin now for easy access to the attractions in Gatlinburg and hiking trails in the Smoky Mountains.